Purchased by the Art Gallery of New South Wales Foundation in 1994, 'Woman of Venice VII' is the first sculpture by Alberto Giacometti to enter a public art collection in Australia. It is one of nine bronze figures that were created as 'states' of a single figure modelled in clay on a single armature over a period of about three weeks and cast in plaster by the artist's brother, Diego. The hands held at the side of the figure's broad body emphasise the corporeality of the figure and recall Giacometti's early experiments with female spoon-like forms. As in other works in this series the tension created between the heavy wedge-shaped pedestal and the figure's tiny head endows the piece with a sense of the visionary that the artist favoured. 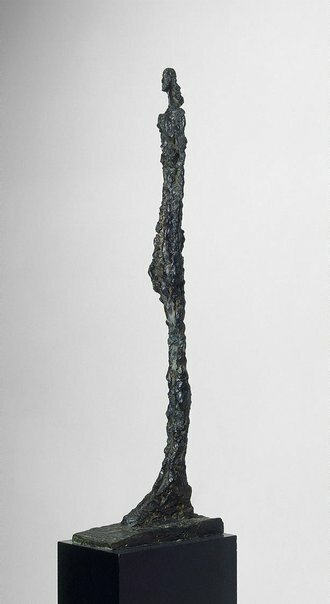 The heavily textured quality of this work and original patination make this one of Giacometti's most distinctive and successful female figures. This work perfectly embodies Giacometti's ambivalent attitude towards women whom he idolised but whom he also found suffocating and incomprehensible. 'Woman of Venice VII' encourages the viewer to engage imaginatively with its mysterious subject. Whether we interpret her as a goddess or prostitute, Egyptian cult figure or decomposing corpse, one cannot remain unmoved by Giacometti's powerful interpretation of humanity. No.5 in an edition of 6. Signed left edge of base, inscribed into metal "Alberto Giacometti". Not dated. Edmund Capon, Look , 'Giacometti in the gallery', pg.24-27, Sydney, Jul 2006, 24. Bernard Rigby, Look , 'Getting to the essence', Melbourne, Jun 2001, 34 (colour illus.). Alberto Giacometti: a biography of his work , Chapter IX 'The Great Work', pg. 371-461, Paris, 1991, 404 (illus.). cat.no. 381, Private collection. It is not known if this is the AGNSW cast as it is not known which cast is illustrated. Alberto Giacometti , New York, 1965, 69 (illus.). cat.no. 55, 'Figure from Venice VII', lent by Pierre Matisse Gallery, New York. It is not known for sure if this is the AGNSW cast as it is not known if Pierre Matisse Gallery owned more than one cast at the same time and if so which one was exhibited. Art Gallery of New South Wales Foundation Annual Report 1997 , Sydney, 1997, 21 (colour illus.). Look , 'Moving sculpture, taking the sculpture off the plinth and putting it back in the real world' Tony Bond and Jill Sykes, pg. 29-31, Sydney, Aug 2003, 29 (colour illus.). Giacometti: sculptures, prints & drawings from the Maeght Fondation , Sydney, 2006, (illus. ).